At the top of the South Place Hotel, London lives a seafood sanctuary named Angler Restaurant. Run by Head Chef Gary Foulkes for the past few years, Angler has maintained its Michelin-star status for its conscientious, yet ever-changing menu. The closeness to the stars invites in an atmosphere of creation which is amplified by the fine dining dishes placed before you. The stimulation of senses is where the spirit of a good experience lies. 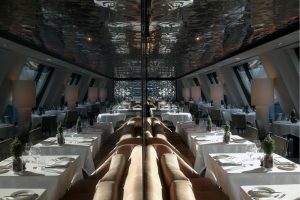 Angler presents its delicate dishes as an exhibition of style and elegance, tended to perfection. The aesthetic is that of an organic yet inspired nature, such as the Ravioli Dorset Crab with chicory, orange and basil. The sight of the course placed before you provoke a deep desire instantaneously that starts in your eyes and leads to your stomach, igniting every delight in you. Gary Foulkes and his Team perform their own unique art process when creating their signature dishes. The outcome is an exhibition of earth tones, bright colours and organic shapes as seen in the Warm Salt Cod with seaweed, smoked eel and Wye Valley asparagus. Once your eyes have indulged in its wonder, the flavour that follows will fulfil every need that may have been there prior to the meal. To add to the entire experience, the setting predicts the mood with a fine view and air of grace as you sit high above the world, encountering a fresh new side to seafood. A night at Angler Restaurant proves itself worthy of its highly esteemed ratings and reputation. From its inviting starters to the decadent dessert menu, the restaurant satisfies your every sensory need and places high expectations on any future seafood endeavours you may encounter. This establishment will leave you enthralled with a renewed appreciation for fine seafood cuisine, creating an enthusiasm you never knew could exist for food.